Over 200 demonstrators, a majority Palestinian, rallied and marched in Atlanta on Dec. 16 to oppose U.S. recognition of Jerusalem as Israel’s capital. The demonstration, organized by Jewish Voice for Peace, was supported by Students for Justice in Palestine, the International Action Center and the International Socialist Organization. 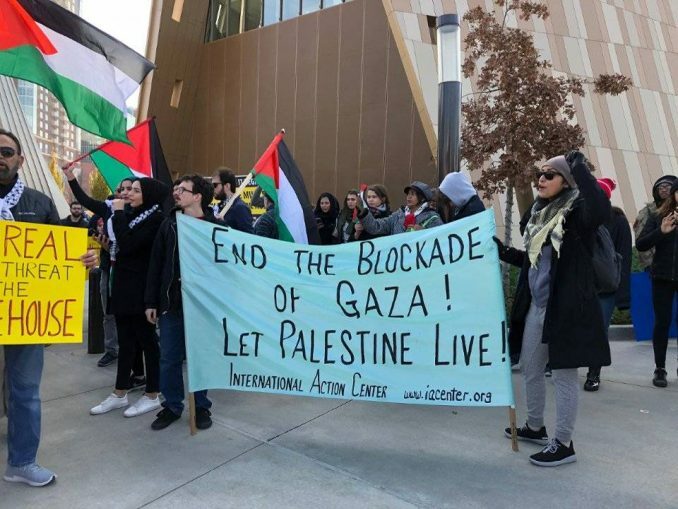 Speakers denounced the oppression of Palestinians, the role played by the U.S., and supported the need for international solidarity against racism and imperialism. Oppression in Palestine and Atlanta are intimately connected. Through the Georgia International Law Enforcement Exchange program, Atlanta police officers learn repressive police tactics used by Israel against the Palestinian people. The police then use these tactics against communities of color in Atlanta. Outside CNN headquarters, protesters drew attention to the central role major U.S. news outlets play in covering up the daily brutality Palestinians face. They charged the city’s powerful in the crime of Palestinian oppression. In response, CNN guards threatened to call the police on protesters.